As parents we always find something that is beneficial and educational at the same time entertaining to our kids. It turns out the playing LEGO has far-reaching developmental benefits for your kids, way more impactful than just motor coordination. It also teaches them teamwork and communication when playing with friends, patience and organisational skill will also develop and will enhance focus and concentration. 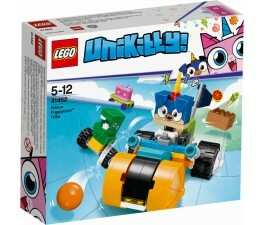 So, let your child build, customise, and play LEGO Unikitty that is readily available at Mr Toys! Shop online now and enjoy our effortless shopping experience! Your kids will be amused with this half cat- half unicorn, that can change colour or physical form. Unikitty is the active, bubbly and brilliant princess of Unikingdom. She is a creative thinker and manages when there's a problem in need of a solution. How about collecting them all today at Mr Toys! We deliver directly to your doorstep Australia Wide. Shop Online now!